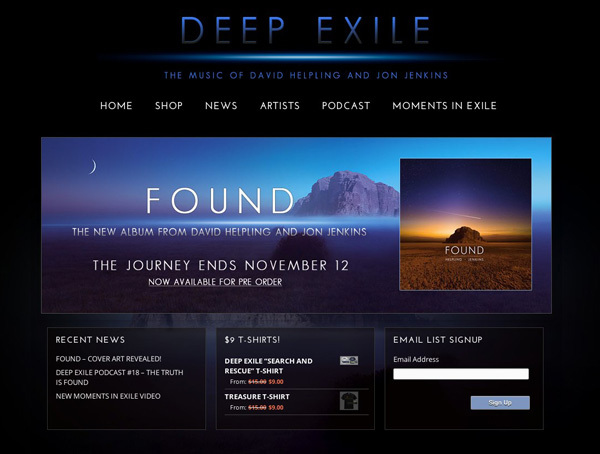 In June of 2007, DeepExile.com was launched as the online home to the music of ambient-electronic recording artists David Helpling & Jon Jenkins. During the six years that followed, the website has served as a portal into not only our collaborations, but also our solo projects. Since then, DeepExile.com has been a direct line from us to the listeners, the one location with the most up to date information and current news, along with an online shop for ordering the music and other special items not available anywhere else. The old website served us well. It lifted us out of the deep, and took our music to the ends of the earth. Today, we find ourselves standing at the edge of tomorrow with a new album on the horizon, and the time has come for a new online home to enhance the experience. We hope you’ll find it to be an enjoyable place to visit; informative, easy to navigate, and a pleasant online experience whether you are ordering from the shop, listening to podcasts, watching videos, or just looking around. As always, we are deeply grateful for your support! ← FOUND – Cover art revealed!